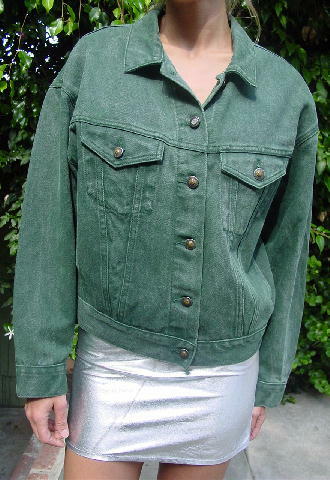 This early '90s dark green 100% cotton jean jacket is by Anchor Blue. It has 6 metal buttons down the front, one of which has its center missing. The long sleeve cuffs also have one metal button on each. 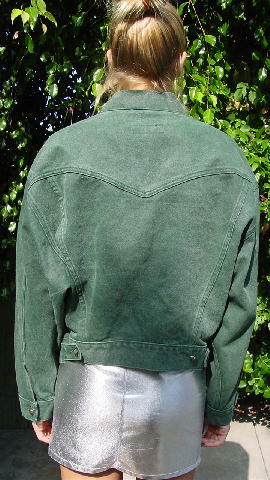 It also has 2 breast pockets with 1 button flaps. The back waistband has 2 straps and 2 buttons on each side, so you can adjust the fit. The tag says size M, but it fits like a size L.
shoulder to shoulder 22 1/2"
shoulder to end of sleeve 21 1/4"
shoulder to hem 20 3/4"
bottom hem side to side 18"
armpit to armpit 23 1/2"